Aren't you glad it's Friday?? I swear, this week felt so very long and not in a good way either. I'm so glad the sun is out melting the snow, although it is going to take some time for the mountains of snow to melt away. But I'm happy because tonight I get to hang out with my girls and just have a good time. 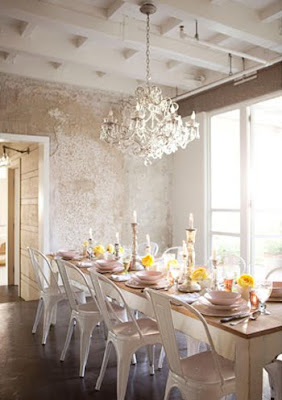 Don't you just think the photo above is magical in an old-world, rustic-with-a-touch-of-glitz way? I do! And it looks so warm and inviting and I can actually picture friends gathering to have a great ol' time. Very similar to what I'll be doing tonight. Can't wait ladies!